Links to New Mexico fertilizers, organic fertilizers, fungicides, nutrients, agricultural pesticides, agricultural insecticide manufacturers, distributors, suppliers and traders. 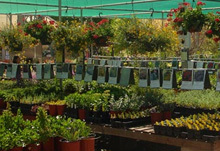 Santa Fe Greenhouses has been voted the Best Nursery in Santa Fe and offers locally grown, drought tolerant, xeric, native plants cultivated to thrive in the southwest gardens of New Mexico. A tremendous plant pharmacy with a large selection of organic fertilizers, pesticides and herbicides as well as a wide range of non-organic, s afe products to combat just about anything else you might find in your garden. Our products work well with trees, shrubs, ornamentals and turf. A line of hogs that have incredible marbling, tenderness and flavor. AHL Garden Supply is proud to carry the best selection of organic fertilizers, soil amendments, potting soils and natural pest controls in the state. We have what you need to expand your green lifestyle into the indoor or outdoor garden.